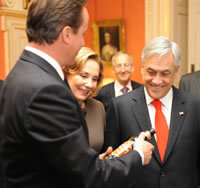 David Cameron presented the Chilean President Sebastian Piñera with 33 bottles of London Pride yesterday, one for each of the trapped miners. Mr Piñera is currently visiting the Uk bringing with him a a piece of rock ‘paperweight’ from the collapsed Chilean mine. In return Mr Cameron provided bottles of real ale brewed at Chiswick Fuller's Brewery for each of the miners to enjoy as a gift from the UK. 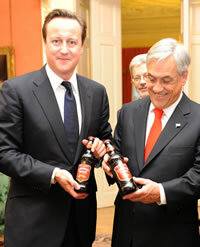 "How gratifying was it to see that David Cameron presented the Chilean President Sebastian Piñera yesterday with 33 bottles of real ale," said Campaign for Real Ale's (CAMRA) Louise Ashworth. "For years CAMRA has been calling on both local and national politicians to use our national drink for celebrations and we've usually been ignored so it was great news to see Mr Cameron taking some pride in real ale and presenting it to Mr Piñera. "Well done Mr Cameron, you've finally got the message." Brewery Director Richard Fuller, told ChiswickW4.com, "We are delighted that the Government has chosen London Pride as a gift to the courageous Chilean miners. We trust it will be a very welcome return to one of the small pleasures in life. "The entire country has been nervously watching their rescue, hoping for a positive outcome. We hope that this small gift will show that the whole nation is relieved they are safe and well and would buy them a drink if they could." David Cameron is no stranger to Fuller's Brewery after enjoying a pint of London Pride whilst on his campaign trail. Accompanied by the now MP Mary Macleod, the pair met with Fuller’s Board members for an informal discussion before being taken on a tour of the brewery.